I'm a lazy pizza maker. There, I've said it. Living in New York, it's easy enough to satisfy a pizza craving by simply walking two blocks in any direction of my apartment but I don't so much care for those thin pizza parlor slices. OK, I may have just jeopardized my right to live here but I've said that now, too. There are several excellent options for pre-made artisan dough around here and I tend to keep balls of it in my freezer. Are you sort of thinking of forgiving me? 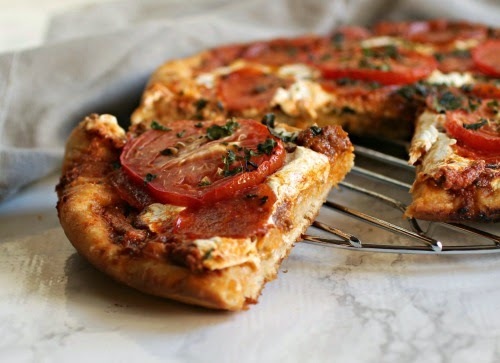 But I tend to dump whatever form of tomato sauce I have in the house, some pre-shredded cheese and slices of pepperoni on it, put the whole thing on a sheet pan and shove it in the oven. Wait! Come back here. I can do better, I promise. I'm probably still going to use the pre-made dough because it's really good. 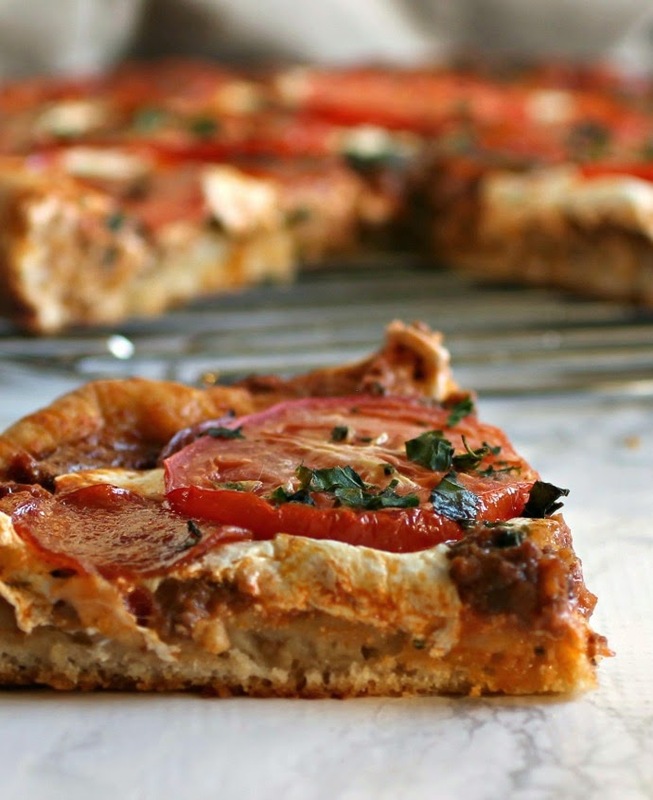 Feel free to substitute your own fantastic homemade pizza dough recipe. But I decided it was time to do my homemade pizza justice by taking care how I made it. 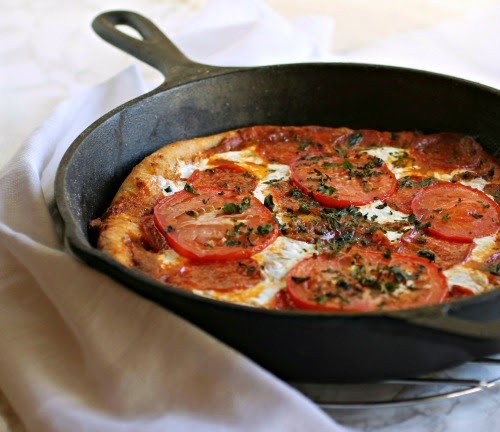 And since I seriously favor the thicker crust, thicker pizza option, I went a little deep dish and used my cast iron pan. An excellent option for homemade pizza, by the way, since I think most people don't have a proper pizza stone. Are you a bit more inclined to listen now? The fillings are really a matter of personal choice and somewhat based on what you have in the house. I had some leftover chili but any ground beef will do. And why choose between red sauce and white ricotta. I love both so I used both. But probably one of the best things I did here is the cheese. When I was at the butcher over the weekend for the chili meat, I saw they had balls of fresh made mozzarella and I bought one. I could seriously just eat the whole thing standing up in my kitchen but what a fabulous addition it made to my pizza. One taste and I was in pizza heaven and I knew there was no going back, ever. And the roasted taste of the tomatoes on top? SO not optional. And now I'm not a lazy pizza maker anymore, homemade dough or not. Enjoy! Add the olive oil to a 9" cast iron pan. Roll out the dough on a floured surface and place in the pan. Stir half the basil into the ricotta cheese and spread on the bottom of the dough. Top with the tomato sauce. Crumble on the beef followed by the mozzarella cheese. 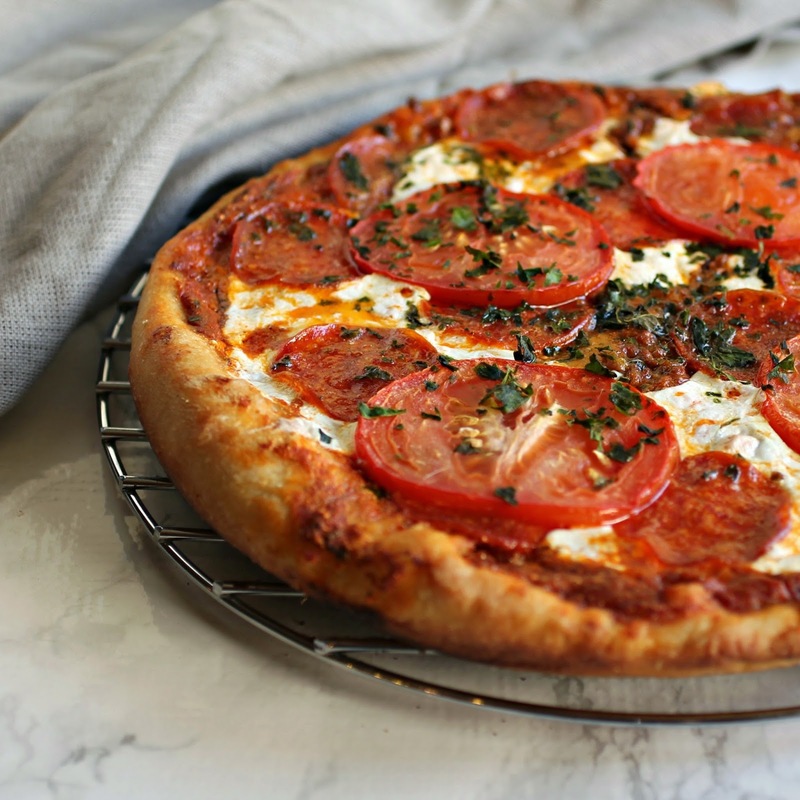 Top with the slices of pepperoni and the fresh tomato. Sprinkle on the remaining basil. Place the pan on high heat on the stovetop and leave for 2 minutes to heat up the pan and get the bottom of the crust started cooking. After the 2 minutes, move the pan to the oven and cook for an additional 18 minutes. I live in NYC too, and would love to know where you get your pizza dough, and which brand you prefer. Thanks! Can't wait to try this recipe! Hi Arli! Love hearing from a fellow New Yorker. If you order from Fresh Direct, they have great individual sized frozen pizza balls. I've also had good luck at gourmet stores like Agata & Valentina on the upper east side. Most likely Dean & Deluca would have it as well or Grace's Market. Good luck! OH MY GOSH! I love deep dish pizza! Oh my gosh! I want this soooo bad! Looks fabulous. I'm kind of a lazy pizza maker too. Especially considering that pre-made dough you can get is so good these days. I'm excited that it's spring and I can start grilling pizza's again too. More laziness there because less dishes! Ha!